The WORLD's FIRST Powdered Form of CBD for Horses by Bare Roots Trail! Amazing support for equine comfort in joints and body and supports help to overcome all forms of inflammation. Bare Roots Trail offers top-quality, natural products at affordable prices. Toni Snoke, CEO, is an avid pet lover and soon to be horse owner. She has worked with horses and was able to create the FIRST ever CBD in powdered form for horses and dogs. Her online storefront at BareRootsTrail has several categories of items available including CBD for you, your pets and your horses, Raw Honey, Organic Teas and Herbs, Pure Maple Syrup, Essential Oils and an array of All Natural Skin Care products. Reduce stress and maintain your well being with Bare Roots Trail! Why Should I Use CBD For My Horse? Our Equine CBD Powder is highly effective in helping to restore the health and well being of your horse! Many horse owners report that when their horses are on our Equine CBD Powder, that they can elimintate other supplements from their hoses's regimine-- thus saving money while increasing the health and well being of their horses! * Beneficial to horses with muscle soreness-- particularly Azoturia or "Tying Up Syndrome"
* Overall health and wellbeing. Very supportable of the endocabinoid system, maintains homeostasis in your horse. How Does CBD Work In My Horse's Body? All mammals, including humans, naturally produce cannibinoids such as CBD. These cannabinoids attach to something called our endocannabinoid system-- which has CB1 and CB2 receptors, located in the brain and throughout the nervous system. CBD specifically interacts with the CB1 and CB2 receptors to help stregnthen the immune system-- naturally! But How Can Equine CBD Help So MANY Areas Of My Horse's Body? Within Equine CBD Supplement, there are over 113 cannabinoids, including CBD, each with their own unique properties and genral herbal effects. This is why our Equine CBD ALONE can stregnthen and affect so many areas of the body in a positive way. CBD is just one of the 113 cannabinoids within the hemp plant that your horse will be receiving! Why Are Cannabinoids Vital To The Health Of All People and Animals? When our bodies don't produce enough cannabinoids, the endocannabinoid system will not be able to funtion efficiently. When this happens, it leaves the animal (or person!) vunerable to disease, inflammation, and to ailments within the body. CBD works well for animals and humans as it helps keep your endocannibinoid system working at optimum performance. Does Bare Root Trail Have CBD Products For Dogs and Cats Too? You bet and all with the same outstanding quality! Our Dog & Cat Products include our full spectrum Powder, Oven Baked Treats, CBD Sprays and more... all with varying amounts of CBD to fit your particular needs. We are also very happy to talk to you about your dogs, cats (horses too!) to help you get just the right product for your needs. Whether your pet suffers with anxiety, diarrhea, digestive upset, joint discomfort, CBD can help! 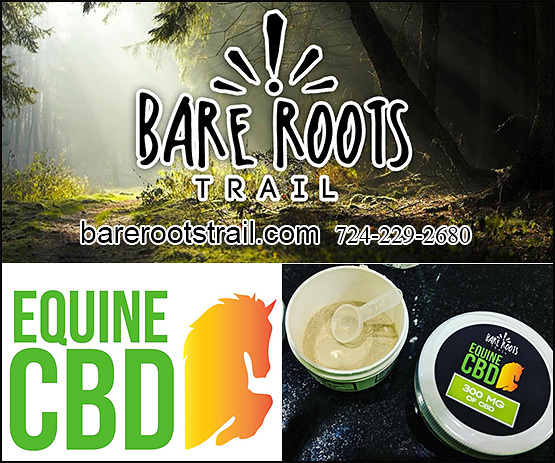 Order YOUR Equine CBD POWDER (or Pet CBD) By Bare Roots Trail TODAY! Equine CBD is a unique CBD product like no other for horses, dogs and cats. It is PURE CBD in powder form which can be admintered in endless ways. Depending on your animal's preference you may want to mix the powdered supplement in a syringe with water, mix in the feed or put in a capsule. The uses for this amazing product are endless such as for overall general health, chronic pain, inflammation, GI issues such as ulcers, anti anxiety, anti nausea, immune system enhancement, muscle relaxant and much more. Dosing guidelines are noted on products packaging to help give you a starting point. We will also provide an information guide with your shipment. Please contact us with any questions as we are excited to help you! !